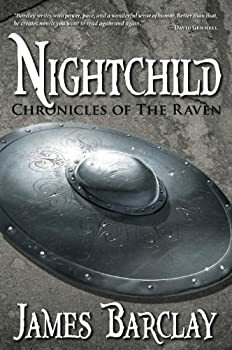 Nightchild is officially the third book in the CHRONICLES OF THE RAVEN trilogy by British fantasy author James Barclay, but it feels like a completely separate novel from Dawnthief and Nightchild, which were so strongly connected that they could have been published as one long story, with book 2 picking up right where book 1 left off. Nightchild, by contrast, starts 5 years after the end of the previous book, and while it continues some of the plot lines from the first two books, it feels like the start of a brand new story. At the start of Nightchild, the mercenaries collectively known as the Raven have moved in separate directions after having saved Balaia from the Wesmen and invading dragons from other dimensions. Hirad Coldheart is busy protecting the remaining Kaan dragons, The Unknown Warrior has started a family, Thraun is still stuck in his wolf form, Ilkar is busy rebuilding the ruined Julatsan college of magic, and most importantly, Erienne and Denser have a daughter, Lyanna, who at just 5 years old, presents a great threat to Balaia. The entire novel revolves around Lyanna, the “Nightchild,” whose inability to control her tremendous power has disastrous consequences for Balaia. The Raven — including the child’s parents — will attempt to protect her from the different factions that are trying to control or even destroy her. In Nightchild, James Barclay basically does everything he did in the first two books of the CHRONICLES OF THE RAVEN, but just a little bit better. The novel is more tightly written, the characters have by now acquired some depth, and the plot is less simplistic. While the hectic pace of the first two novels occasionally lent them a cartoon-like quality, Nightchild is more evenly paced, better crafted, and simply a more enjoyable read. Regardless of the ending, this novel represents a big step in the right direction. If you liked Dawnthief and Noonshade, you’ll love Nightchild. And if (like me) you weren’t entirely blown away by the first two books in the series but kept reading out of curiosity, your persistence will be rewarded, because Nightchild is easily the best book in the trilogy. I have seen this book in the stories, well the series, in the bookstores. I have considered picking them up from the beginning to read them. But something kept stopping me. I don’t know why. I am going to have these on my list to read but probably wont get to them for a while. Thanks for the reviews on these books, they have helped shed more light on the books for me to sway me.